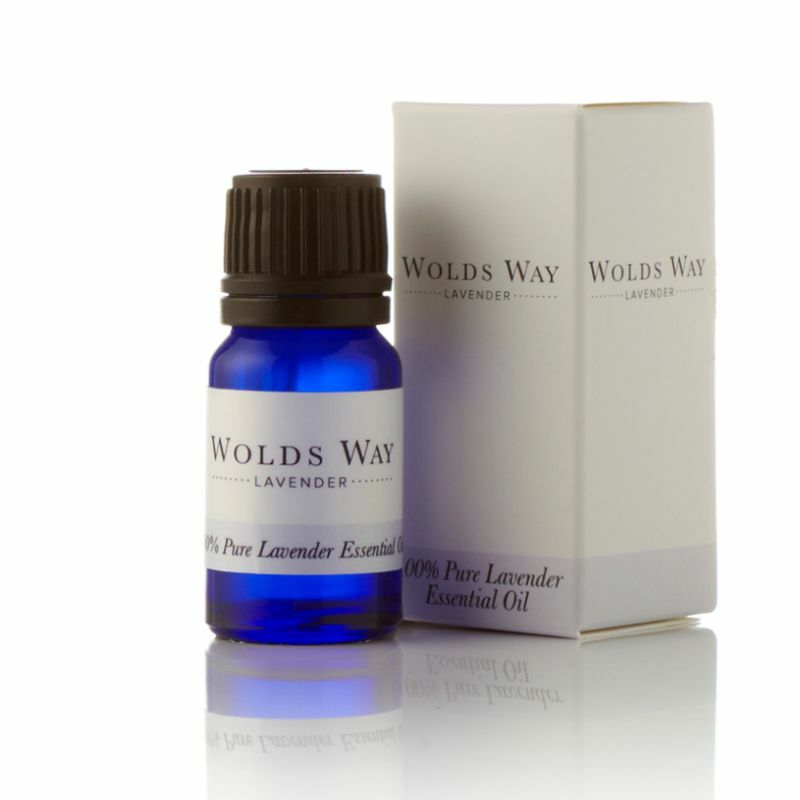 The key ingredient to all our products is our 100% Pure Wolds Way Lavender Essential Oil that is distilled here on site from the Lavender growing in our fields. Here at Wolds Way Lavender we use the traditional method of Lavender steam distillation to produce our unique essential oil of Lavender. Our Lavender Essential Oil is 100% pure. It contains no additives or preservatives. It is grown organically (although we are not organically certified) without pesticides, herbicides or insecticides. It is a natural substance involving no chemical process. It is carefully stored before being used in our range of Lavender products or sold in 10ml bottles for you to use as you wish. Lavender essential oil is an all-round soothing natural product which has numerous benefits. We have around 5 acres of lavender growing here at Wolds Way Lavender with over 120 lavender varieties. The harvest is carried out when the lavender is in full bloom usually at the end of July and throughout August and depending on the weather. We have to wait for dry weather if it has been raining we do not get as much lavender essential oil from the plants. When the weather is sunny we have to make the most of it and sometimes we can do three distillations in a day; starting at 7.30 in the morning and working until 9 at night. The first task of the Lavender distillation process is to cut the Lavender. 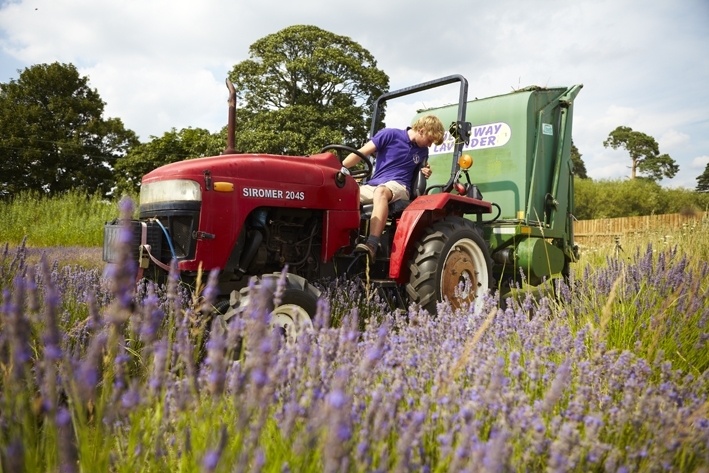 The Lavender is collected from our fields using our Tractors and specially designed lavender harvester. In the early days we cut the Lavender fields by hand, this was a massive and labour intensive task. In 2006 the 2nd year we harvested we built a Lavender Harvester. This has reduced the task of cutting and gathering the Lavender from 10 people to one man or woman and a tractor. It also makes sure we don’t miss any flowers. The Lavender Harvester gathers the freshly cut Lavender into its bin. The tractor with the Lavender Harvester drives up to the hopper at the end of our Narrow Gauge Train line and tips the freshly cut Lavender into the trains goods truck below. Our Narrow Gauge Loco brings the Lavender in from the Lavender Fields to the Lavender Distillery. This is the only working railway of its kind in the UK. The train also has passenger carriages for when it is not working. The train is a great way for less abled visitors to get out and see the lavender in the fields! The Lavender steam distillation process has not changed over the centuries. The Lavender Distillery here at Wolds Way Lavender is unique in that it is wood fired as in the days of old. Modern stills use electric or oil steam boilers that steam the essential oil from the Lavender within 40 minutes whereas our still takes around 3 hours to extract the 100% pure Lavender Essential Oil, with lavender oil starting to appear after approximately 45 minutes. Once harvested and brought in, the freshly cut lavender is loaded into the Still ready for distillation. The fire heats up the water in the giant kettle to produce steam. The steam passes up through the large vat containing the lavender. The heat of the steam breaks down the plants to release the lavender oil molecules which are then carried by the steam up into the condenser. Once the lavender is in and the distillation has started the water level and pressure are checked every 15 minutes. 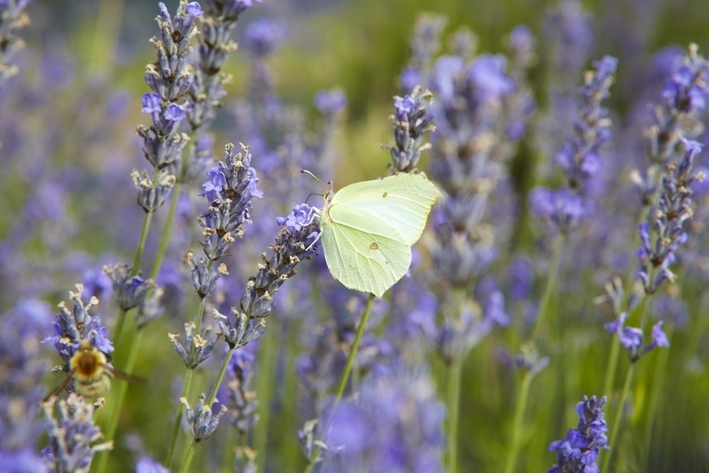 Visitors enjoy seeing the Lavender Oil start to gather but the highlight is watching the “change-over” of the lavender to replace spent lavender with freshly cut lavender. When the lid of the Still is removed the whole distillery room fills with steam and the strong fragrance of lavender. Our distillers explain the process and answer any questions. When we are not distilling we have an informative video to show and explain the process. Our ponds whilst decorative are used in the distillation process. Cold water from the ponds is continually passed through a condenser to provide a cold environment. 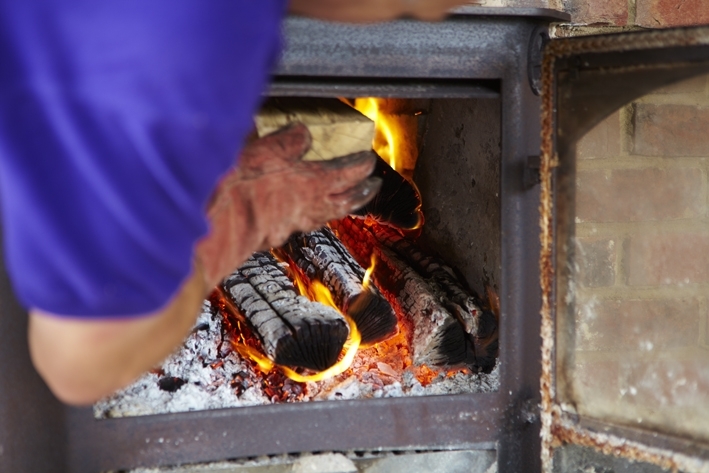 The steam, containing the lavender oil, is passed through the cold environment so that it condenses back to a liquid. The water and oil can are collected in the glass separating jar. We collect the rainwater from the roof of the building to keep the ponds topped up. 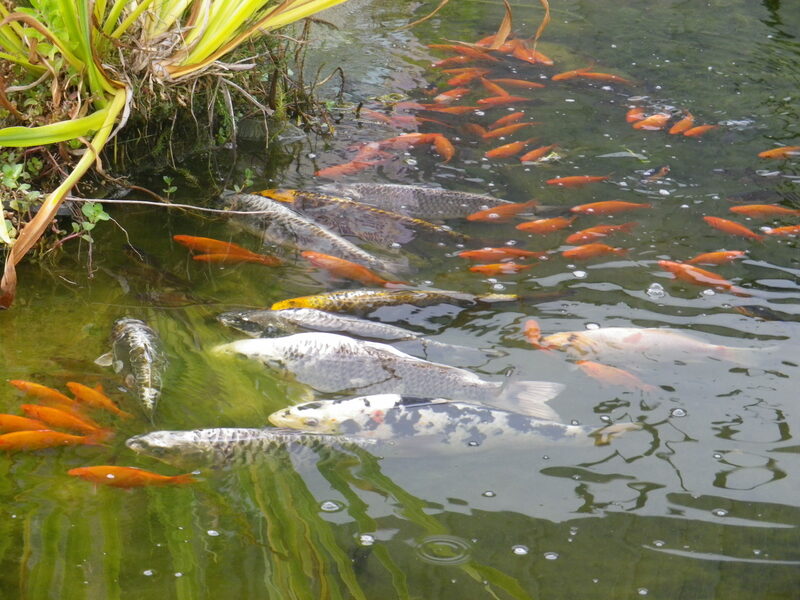 Interestingly the fish in our ponds gather round the fountains that bring back the slightly warmer water. As lavender oil is less dense than water it sits on top of the lavender water and can be siphoned off and filtered to remove any remaining moisture. It is then stored in sealed containers for at least six months before it is used either neat or in our range of various products. The water that is left is called lavender floral water or lavender hydrolat. The lavender floral water is a by-product of the steam distillation process but it has its own uses and properties as well. These are natural products, we have not made or altered them, just removed them from natures store; the Lavender Plants!